And with the latest update of the blogging software I’m using here (WordPress) they also released the annual new theme. And boy I liked this one to be honest! Also I will soon do a giveaway! Better subscribe to my YouTube Channel to not miss the great stuff I’ll hand out! Seriously! Finally during the last week and at the weekend I could catch up with my vlogs. Here the last two of that last week catch-up run! 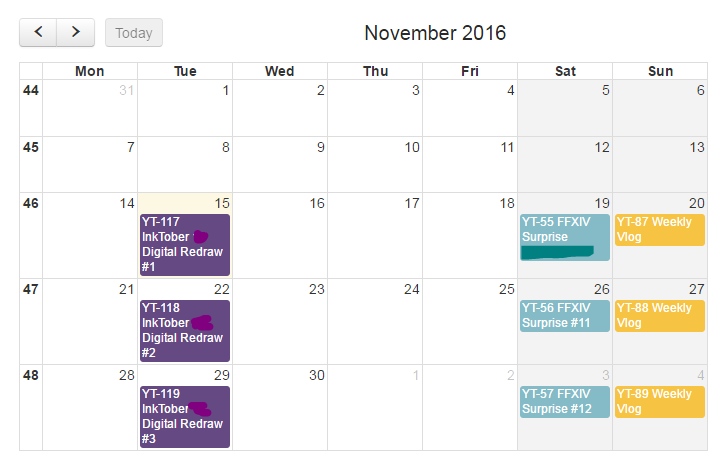 And now that all is told, here a sneak peek of the new video-schedule I worked out for this month. Looks boring and I probably won’t be able to get the inktober redrawings out on tuseday every week… but still, a plan is a plan! Becoming a YouTuber in one Year! Countdown START! Yes you did read the title correctly. I want to become a YouTube in one year (from now on)! The goal to become one was set long time ago as I always mentioned. But now a countdown started at my workplace and in about a year I’ll loose my job and will need something new. Everything is explained in the following video! Top one is in English, bottom in German. I created playlists for both English and German language for all the video of to BEast that are already available in order to find them quicker and easier. I’ll add new videos to the playlist once I upload them to keep it up to date as we go on! If you have any question, just leave them in the comments down below! I thought to get this thing rolling, I gotta do another surprise drawing as quickly as possible. So here already the second installment! This time featuring three characters who were idle and just standing around almost begging to be drawn. Again, if any of you three that I did draw wants to get their sketch finalized, let me know and I will give it a go! This is something I wanted to do for a while and now finally had some time to try it out: Surprise InGame Drawings! So basically I just log into a MMO and draw whoever I can find while filming the whole thing! Now because my drawings normally take hours to get finished I only do some basic sketches. If the person I did draw notices these videos and sees the sketches, they can contact me ingame and ask for the full picture. Then I will finish the sketches, upload the time lapse video and send the finalized picture to the person I did draw. So simple the rules! For the first time I did do this I selected two Lalafell who were just idle standing around. Packet Loss and Shady Leo are the two character names and here see me draw them!